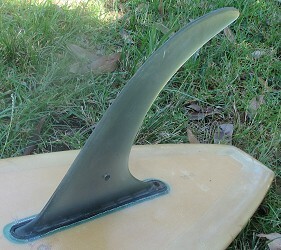 First version of Fins Unlimited (with Chase Parker Bahne, 1967) removable moulded fin and fin box. 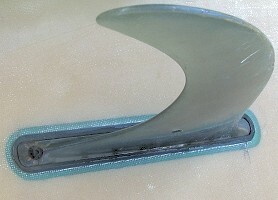 The fin is fixed by a rear bolt only, see image below. Deck: Gordon Woods Surfboards, blue script offset left at tail. 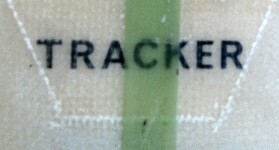 TRACKER, black text on pod, see image below. Gordon Woods Surfboards, blue script on nose. 7571 -pencil behind fin, see image below right..
Clear with 2'' Volan overlaps, green resin centre pinline. Bottom : Clear with 2'' Volan overlaps. Purchased from Aussie Junk Recycling Centre, Mitchell ACT in September 2007. Freighted to Gerroa, Seven Mile Beach courtesy of Craig, Canberra, with many thanks. Image below shows board on arrival with sales sticker, post-production red paint on the nose and Balin legrope in situ. The first commercially available finboxes were introduced in 1968 - WAVESET (by Morey-Pope) and SAFESET (by Fins Unlimited?) - from the USA. The three models were illustrated late1968 / early 1969. Originally printed in Surfing World Volume 12 No. 1 1969. Note advanced fin placement and highly unusual, particularly for Australia, first version of Fins Unlimited fin and finbox. Surfing World Volume 12 No. 1 1969. See advertisement above. Geoff Cater (1999 - 2015) : Catalogue : Gordon Woods Tracker, 1968.